Being Pretty Good At Doing Nothing, It's The Saturday Open Thread. How’s everybody doing this Saturday? I hope the answer is good. I’ve been spending the first part of my extended weekend being lazy and re-watching some of the Simpsons Treehouse of Horror Specials. Although the fact that they have done 28 of these is a little depressing cause I remember watching when 3 first aired. Also since this is the Simpsons there have been a couple of times that the jokes hit a little too close to home with current events. 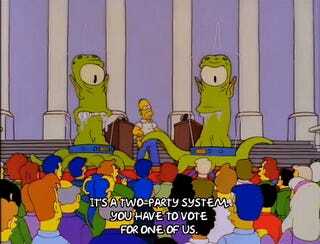 Too soon Kodos and Kang, too soon. 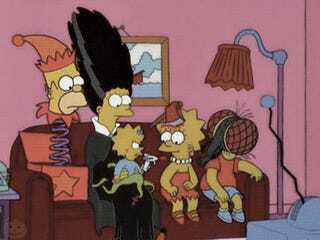 I also have realized that watching these Simpsons specials has also become a Halloween tradition for me. Even if I do have to stop and think about what some of the segments are actually parodying since it’s been about 2 decades since the pop culture references were originally made. So O-Deck, who’s your Saturday going? Got any favorites from the Treehouse Specials? Got any tradition that you follow this spooky holiday? Just want to talk about something else? Go for it, it’s the Open Thread.